Last giveaway's winner is: Sarah from Soccer Chic Knits in Burien, WA. Congratulations, neighbor! Please shoot me an email at yarnonthehouse@gmail.com with your info to claim your prize. Now onto the good stuff! I wanted to say that last week's comments on where your favorite places to knit were wonderful. I really enjoyed hearing about all the fun and relaxing knitting places everyone enjoys. I had to laugh at MamaMay's comment though. She said, "at stop lights or in the bathtub. It is the only 2 places I know the kids will not grab the yarn and make a tangled mess..." You are one talented lady to be able to knit in the bathtub! I love it! I promised a new model for the giveaway this week and I have one. No, it's not me... it's my mama! She finally agreed to do a photo-shoot. Doesn't she look beautiful! Thank you, Mama, for posing for me. I love you. This giveaway ends the series of Madelinetosh yarns, and so I've decided that there will be TWO winners for this giveaway! Yay! I have two beautiful skeins of Madelinetosh Tosh Merino in the Tannehill colorway. 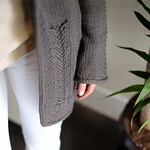 Who hasn't seen The Tea Leaves Cardigan? I love this cardigan, and it's knit in the Tannehill color (here's more examples of the cardi knit up in Tannehill). This is such a unique color! And, Amy said in her interview, "The worst disasters often lead to the best colorways. The best example of this is the color Tannehill." Thank goodness, for disasters! The yarn is made of the softest merino wool, it's worsted weight, and at 210 yards per skein, it's a great yarn! 2) Post a comment on this blog post by the end of Sunday, 4/4/2010, telling me what yarn you would like to see featured on this blog or designer you would like to see an interview with. Is there a cool new yarn that you would love to see on a giveaway? Tell me about it. Or, a wonderful designer that you love and would like me to interview. Tell me what or who you want to see on the blog in the near future, and I will try and work some blog magic. I'm really interested in the Becoming Art yarns but can't quite find any information on them. They are really beautiful! I am curious about the Dream in Color Smooshy yarn. I've heard very good things about it, but haven't yet gotten any for myself. Your mama is indeed a gorgeous lady! I'd love to hear more from indie dyers who have gotten "big" like Three Irish Girls or Blue Moon. I've never tried Blue Moon Fiber Arts but would love to. Them or Three Irish Girls, or of course Malabrigo galore. I'm really interested in learning about more dyers who have a Merino/Cashmere/Nylon base yarn. Sanguine Griffon's Bugga is one, and Handmaiden's Casbah is another, but I'd love to learn about more. I love the squish that the cashmere adds. Honestly, I have not been knitting long enough to really start exploring various yarns. So... Any would be lovely! Blue Moon Fiber Art's Woobu (merino and bamboo) looks beautiful, and I've only heard good things. Of course, I've not had the opportunity to work with it, but I sure would love to try! Yarn I'd like to see featured: Three Irish Girls. I have an irrational love for a couple of their colorways (Strawberry Fields, Georgia Peach, Starry Night), but I can never find them, so I can't order them. But I LUST for them like woah. I think Ysolda Teague would be so fun! I love her designs!!! Any of the previously mentioned yarns would be wonderful, of course. But the designer I'd like to see an interview with is Kate Davies. I love her owl yoke sweater and her paper dolls sweater. They're both cued, and it seems she just has a sweet sense of style and design and I'd like to know where she gets her ideas! I'd also like to see something regarding Three Irish Girls! Melissa LaBarre's Gater Yoke Cardi is one of my favorites - and Tea Leaves looks equally lovely. I would be interested to hear what she is designing next. I've heard such wonderful things about The Woolen Rabbit from bloggers. I've had the pleasure of using one of Kim's yarns and I'm sure the rest of them are equally delicious. I would like to see video tutorials on sock knitting in the round or any knitting or crocheting tutorials. I have a book by Antje Gillingham called Knitting Circles Around but haven't had a chance to work on the socks yet. I think because I am sock challenged. Cat Bordhi is also another designer I would love to see featured. I'd love to learn more about Wool Candy. The colorways and the names are fantastic! I just recently discovered Mini Mochi! I love the bright colours and softness of that yarn!! I'd love to see Three Irish Girls yarn featured. That Sharon is hilarious, she'd make a great interview! I've been drooling over Yarn Love yarns for weeks. I love the names, Elizabeth Bennett, Juliet, Marianne Dashwood, I mean seriously awesome names. wondered how the turn out in large projects since they are hand dyed. I would love to learn more about Spud & Chloe and have their yarns featured in a giveaway. Oh! I've been drooling for Tannehill forever! I would love to see an interview with Ysolda Teague. Her patterns are amazing and I'd love to know more about her. So many lovely yarns mentioned already! I second the Kate Davies nomination. Her designs pushed me from "I want to learn to knit someday" to "I have to learn to knit immediately". I would love some cottons or some merino silk blends in light blues and greens. So funny that the winner is from Burien, that is where I am from! Currently in San Diego for college but moving back after graduation! Such a small world! I'd love to see some yarn from Brooks Farm and Foxfire Fiber & Design. I don't think either of them are easily available. How about an interview with Hannah Fettig? Loving your blog and giveaways! Love the yarn! Ysolda, Veruschka, VickieHowell - all found on Ravelry. Love the yarn! I'd love to see interviews with Ysolda or Jane Richmond. Featuring any yarn by Blue Moon Fiber Arts would be excellent, too. These are just ones that I have recently received yarn from and am using in projects. Beautiful yarn once again! I love www.tottoppers.com, she does great work! I would love to read an interview with Anne Hanson or with Clara Parkes -- two of many ladies of the knitworld whom I admire. Thanks, too, for your generosity in the yarn giveaways. We all can use and appreciate more yarn in our lives. and really any yarns that have a slow transition in colors. And I would ask what her process is when she picks out new projects. i'd love to hear more about blue moon or noro - they're just lovely! and i echo the above comments - how great would it be to hear from ysolda! How about Lucy Neatby for a designer? I have to agree, the small indie designers and dyers who have grown larger than their garage! Congrats to the winner and you have a beautiful mama! I would love to see a giveaway of Beaverslide tweed yarn! I've heard great things about Malabrigo. I'm hoping some local shops will carry it soon. I'd love to see a giveaway with Great Adirondack yarn. I love their colors! I would love a chance to try to win some Malabrigo! Hmm.. I'd love to see something with the schoppelwolle zauberball! I haven't been collecting much yarn lately because I'm trying to convert a corner in my bedroom into a craft space,(where there is a no kids rule) since my kids like to get into my stash and pretend they are cats. But I'm willing to make an exception for this beautiful yarn! I love Knitterella. She is a graphic designer that also does knitting patterns. Here is the link to her blog if you want to check it out. Oooh, I'd love to get my mitts on some Madelinetosh. I've seen pics, but I've never had the opportunity to roll naked....er see if it's as soft as it looks. Lovely colors! I'd like to read an interview with a small but successful dyers (Three Irish Girls!? ), their dye process, where they get their color inspiration, thoughts on base yarns, etc. Fearless Fibers has some wonderful color ways. I have enjoyed these yarns on several projects. 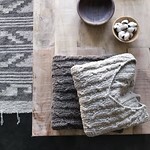 I love the tea leaves cardigan! The yarn looks gorgeous and soft! I would love to try out a bamboo yarn. I love the way bamboo fabrics feel, and I'm betting I'd love the bamboo yarn so much! I would love to see you interview Hilary at the Yarniad blog. 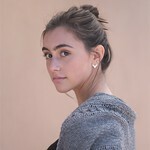 http://theyarniad.blogspot.com/ I love her designs! The next sweater I knit will be her "Betty" design. I love the color of the yarn in the giveaway! I would love to hear more about Sundara yarns, or an indie dyer or two (may I suggest Sunshine Yarns, Mustashyo or MissHawklet). I've heard about Mini Mochi but not had a chance to see it in person. I'd love to hear what you think of it! I'd like to see some lace yarns or perhaps Cherry Tree Hill supersock select semi-solid sock yarn. I just finished knitting up a mobius with the azure colorway, and it turned out beautiful! And, it was a delight to knit with. I am interested in Schaeffer Yarns - I would be especially interested in who they choose the women's names they use for their line. I would love to see an interview with Jared Flood. Another idea is Susie from Juniper Moon Farm, she has a yarn CSA (the 1st in the country) and is a wonderful woman! Jared Flood! Love him. Or The Yarniad or Flintknits. I would like to see something about the Three Irish Girls. There are 3 girls in my family, too but only 2 of us knit. Ysolda Teague! such beautiful designs! I would love to see you interview Three Irish Girls (and as you can see - I am not alone). Thanks for offering your giveaways! What a very nice thing to do. I would love to see an interview with Ilga Leja about her beautiful designs and the Kauni Effekt yarn she uses in some of them. I would like to find out more about Dragonfly Fibers-just got a skein from the Unique Sheep Co-op yarn club. Roxanne from Zen Yarn Garden makes some lovely colorways, as well. As for an interview-maybe Melissa Morgan Oakes-2AAT socks on the magic loop, or Ann Hanson-lovely designs. I would love to learn about naturally dyed yarns such as "A verb for keeping warm". I would love to know what they dye with and how they came about. Love the madelinetosh. Being a knitter on a tight budget I haven't gotten to explore a lot of the different yarns out there but I have seen some beautiful pictures of hand dyed tonal yarns that look so pretty I would love to see them in real life. Wollemise, of course! Seriously. It's the only way I'm ever going to get any. It sells so quick here in the US I can never nab any. I'd love to see some Spud and Chloe being given away - I haven't tried knitting from their yarn yet. I'm also interested in naturally dyed yarn - know of any companies? Nice picture of your mom! The one designer that comes to my mind is Ysolda Teague. She has so many popular designs on Ravelry. I'd like to hear from Blue Moon. A Blue Moon giveaway would be great too! Thanks! I agree with those who would like to see Ysolda - I always enjoy reading her thoughts on the design process. I haven't been knitting long enough to know many designers or yarn types, but I have loved reading about them on here and other blogs. I just love what you do, so keep it up! I love learning about new designers. I am trying to find someone who designs for teen boys. Knits for them are hard to find. I'm interested in the Socks that Rock...can't get any around here!! I love your blog! and can't wait to make the Tea Leaves cardi! Would love to see an interview with Kirsten Kapur from Through the Loops. Very interested in her creative process. hmmm, on Yarnia.net I picked up some gorgeous Lagoon Space Dyed but I can't seem to find out anymore about it. Maybe you can! Oh, I have no clue - I think I would like to see some Dream in Color Smooshy! I would love to get to know Julia Mueller of Laris Designs, her gloves are just amazingly inventive and whimsical. As for yarn, Habu Textiles has very interesting/ethereal yarns like their A-32 Silk Mohair and AK-20 Fiddlehead Fern Cotton Silk. I believe many of the yarns were developed for weaving (?) and would work nicely in lacy summer knits for the coming season. Three Irish Girls yarn IS really nice! I'd love to see some of that! I love Fleece Artist!! And I got some Handmaiden for my birthday and it is fabulous! I would love to see you feature Dream in Color Smooshy yarn. I'm completely unoriginal, but Dream in Color is right up there with Malabrigo in my favorite yarns. I love all DIC yarns, and I have yet to get my hands on Starry (my LYS doesn't carry it). I also seem to have a little problem leaving the LYS without Pagewood Farms' yarns, so there's a more original suggestion. My favorite designer is Kate Gilbert. Thanks again for these contests. I love checking the blog for winners and seeing what they've made with the prize! I have recently heard of a new yarn from New Zealand that combines wool and possum fur that I would like to see you feature. not sure what i'd like to see featured......there's so much i don't know about!!! anyways, whatever you do, have fun with it!!! I love Kraemer's Sterling Silk and Silver. I would love to make some socks from it! Thanks for another giveaway. I love your contests. There are many yarns I'm curious about. As others have said, I'd also like to hear more about Ysolda Teague. Her designs are truly unique. Madeline tosh sounds good, too. And I love the name and story behind it. More fun yarn! As for yarn, I'd like to see some cool cottons reviewed for the summer! Right now my favorite is Sprout. I randomly stopped by the Cascade Alpaca Farm in Hood River OR on a road trip. I LOVED THEM!!! The owners were extremely friendly and I actually fed the animal that produced the fiber. Such wonderful yarn, everyone should check them out. I also bought some Peruvian Tweed by Joseph Galler that is great. i'd like to see an interview with arenda holladay, a great member of the master knitting group. i love learning new techniques and i find experts in the field more interesting than just 'designers'. I really like small indie dyers. What about pancake and lulu on etsy? that's some great yarn. maybe the owner(s) would do an interview. I think it great be interesting to see some Shetland yarn (Jamieson's, etc). Merino is great but there are a lot of other great sheep breeds out there. I'd love to see String Theory Yarns on your site. Their yarn is DEH-CA-DENT, and they're in Maine! My fabulous YOTH Cascade 220 is getting eaten up by my son's rugby-stripe Wallaby. I'm LOVING it!! I second the request for a string theory interview! As a new knitter, I'm still in the early phases of learning the craft and do not have a sufficient knowledge base to make any suggestions. I am excited to be learning more from your blog! I would love a post on 100% cotton yarns of any variety, or a comparison post for cottons. I'd like to know more about the Musk Ox Project in Alaska, and the qiviut fiber and yarn produced there. I would love to see you do an interview with Sheri from the Loopy Ewe. I live her in St.Louis and visit there often and I follow her blog as well..She is so wonderful and her store is absolutely adorable.her elves are some of the most helpful and friendly helpers ive ever seen at a store. It really is heaven on earth for all knitters. I love Fleece Artist and Hand Maiden Yarns. I've used them over the past few years and they're delicious to work with! It would be great to see these yarns on your blog. i noticed that someone mentioned dream in color smooshy--i'd love to see dream in color classy! it's buttery and lovely, and the colors are so gorgeous. i had some smooshy in nightwatch, which has much more cobalty blue tones than pictures usually indicate, and i'd LOVE to get that colorway in classy sometime. I would love to see you feature a pattern that can be made from the one skein of beautiful yarn that you give away every week. Maybe even featured by the designer? It would be a little tease about the yarn coming up too. OMG! Your mom is gorgeous and Tannehill is my colorway. Seriously. I love this color. How much do I love this color? I love it so much I'm considering giving up coffee to afford to buy this yarn. But would I be able to stay alert enough to knit with it?? I'm interested in a review or seeing projects made with cormo wool. I touched some cormo yarn once and it felt like velvet. But I've never seen it knit up or read anything about cormo wool's pros/cons. i would love to see some socks that rock, or really anything at all from blue moon fiber arts. their stuf is bonafide drool-worthy!! I am interested in Jojoland yarns but I can't buy them locally at all. I like the tonal gradations and I'd love to hear what other people think about the yarn lines. I'd love to see an interview with Chrissy Gardiner. She seems pretty down to earth. I love the colorways that Kangaroo Dyer has on her etsy site, but I've not spoken with anyone who's tried them yet. I'd love to hear a review about the yarn quality and if the dyes are colorfast. etc. What a wonderful/beautiful family you have! As for a new yarn... hmmm.. you've hit on some beautiful/wonderful ones... I'd have to say Blue Moon Fiber ARts - I made the Baby FEb. Lady sweater out of their sock yarn, and it was a dream to work with! loved it loved it loved it! I also enjoyed the pictures of your other winners - what fun! Someone beat me to asking to see more about the designer Kirsten Kapur! And I agree with the request to hear from indie dyers who have made it big. Thanks! Ooohhh...there's so many I'm interested in. I just got two skeins of Dream in Color Smooshy I'm excited to work with!